Slither.io is a huge multiplayer browser game that was developed by Steve Howse and was launched in March 2016. In this game, you have to control an avatar that is similar to a snake which feeds on multicolored pellets from other players and which naturally spawn on the map. 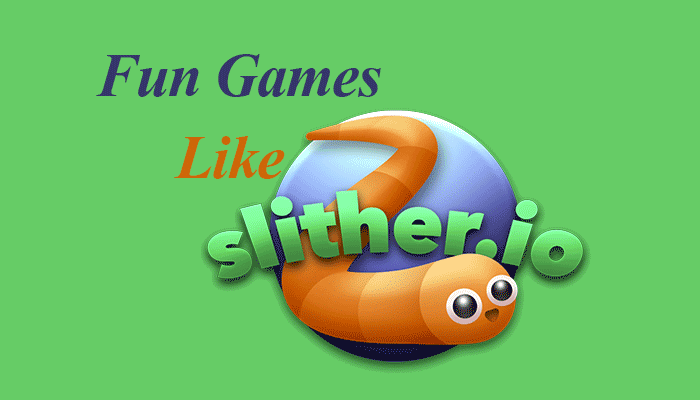 Your primary objective in this game is to grow the longest snake in the server; the classic arcade game Snake is one of the similar games like Slither.io. This game has been a big hit almost all over the world. I love playing this game. If you have been bored playing this game and are looking for Slither.io alternative, then this article is for you. Below are the list of cool games like Slitherio. Go though the list and choose your choice game. 9). Meme: Eat ‘Em All! Let’s talk about best fun games like Slitherio. Agar.io is probably the most famous in the list of fun games like Slither.io. This game has been downloaded more than 100,000,000 times. In this game, users play as a dot instead of a snake. The objective of this game is to consume small balls or other smaller players to grow (with increasing size, the movement speed decreases). SuperSnake.io can be summarized to be the combination of Agar.io and Slither.io; it comes at 2nd place in the list of Slither.io like games. While you play as a snake, your primary objective is to consume scattered objects for growing. With advance levels, you will get many obstacles like spiked walls (that kills you in an instant), but you also get many power-ups like shields and even powers to become invincible. This game has been categorized to be a geometric game, with minimal graphics and a dark background. Similar to games like Slither.io, here you play as a triangle and the main objective of this game is quite similar to what I said for the other games like Slither.io. The only difference is that the players consume the dots to climb to leaderboards instead of growing. Here you will also get a gun to fire at other players. This game is not simply like other games similar to Slither.io. It is an exact clone of Slither.io. This game runs much smoother and has a chat option which is not available in all Slither.io like games, which makes the gameplay very interactive and unique at the same time. You also have the option to zoom the map in this game. If you are bored of all the snakes and worms, then this is just the perfect game for you. As the name suggests, you play here as a tank with the objective to shoot all the enemy tanks, while you stay out of the enemy line of fire. To battle strong enemies, you have different upgrades, the game has a slightly different mechanics but deserve a place in the list of Slither.io like games. Mitos.is can be defined as a streamlined and upgraded version of Agar.io. This game has different game modes to keep you entertained, similar to other games like Slither.io. You play as a cell which has the objective to grow and eat the other opponents. You have various abilities in this game, like the ability to eject mass and speed up, the ability to split and create clones. You also get many upgrades like potions, armors and much more. This is the only game in the list of fun games like Slither.io that has a completely different mechanism. This game starts with a block. And Main objective here is to capture the maximum area by moving around the free spaces, a snake like long line goes out to capture the spaces but if your enemy snake collides with your block while you are gone, you loose. This game sounds similar to all Slither.io alternative, but the fast space makes it all the more difficult. This game is more similar to the classic arcade game Snake with the main objective of not crashing. As your line moves, it becomes longer and faster; there is nothing to feed on, just survive. You also have to avoid crashing into other games; the presence of so many players on a single map makes it very difficult, similar to the Slither.io like games. Osmos HD is yet another game in the list of other games like Slither.io. It is the only game in the list that has single player, but its highly sophisticated gameplay convinced me to add it to the list. In this game, you play as a cell which moves by propelling substances to consume on motes. While propelling you must be careful about the amount you release, or else you will become small and fragile, ultimately consumed by bigger cells. The gameplay which includes balancing speed and size along with the graphics earned the place in the list of games like Slither.io. If you ever dreamed of having the famous meme faces in a game similar to Slither.io, then your dream has been true. In this game, you play with one of the famous meme faces (you have the power to choose the face) and consume on food to grow. The play is similar to all the games like Slither.io, where you stay from the bigger faces unless you want to be eaten. The only difference is the difficulty level, here consuming food leads to slight growth, so you have to consume lots to survive. This weirdly named game is the only game in the list of fun games like Slither that is completely similar to the classic Snake game. You play as a snake who consumes on food to grow, with growing size, the difficulty also increases. This game has a very simple interface with various game modes (these also have very weird names). It also has a chat section to the left, which makes it a unique game in the list of games like Slitherio. If you ever thought that all the other games like Slitherio are only confined to snakes and worms, then this game will break your misconception. In this game, you start off as a small ant who consumes on smaller insects to grow, avoid larger insects to prevent being eaten. Once your ant is big enough, you have to fight a boss; the game has fun visuals and gameplay which makes it more interesting. Unlike all the games like Slither.io, Snakepit.io pays you to play. It has the same controls like Slither.io, you eat dots and smaller snakes to grow, and avoid larger snakes to prevent being eaten. In addition to dots, there are stars scattered around the map, a collection of thirty-six such stars will lead to one $.25 Amazon Gift Card Reward. Before you rush to earn money, I would like to inform that this game is still in the beta stage, and so the stars appear very slowly. My frog.io is another game in the list of fun games like Slither.io that is animal based. Similar to all the games like Slither.io. You have to consume mass to grow; the only different thing is that you don’t attack your opponents directly, instead you leave a trail of dots that kills your enemy if they touch it. The graphics and intuitive gameplay make it the most refreshing game in the list of all the other games like Slither.io. This list of games like Slither.io doesn’t complete without adding the classic Nokia Snake game. This version of the game runs online as a flash based program and the GUI resembles the classic green Nokia screen which brings up a nostalgic feeling. In this game, you control a snake that feeds on blobs that randomly appear on the limited map. You grow by eating; this game ends when you hit the wall or accidentally hit yourself. This game has three different difficulty levels and leaderboard as well, anyone needing a dose of nostalgia must check this game out.